The FundersClub portfolio includes 234 top technology startups headquartered in Silicon Valley, across the U.S., and abroad. With this access, we are well positioned to study how US technology startups are tackling the critical issue of workplace diversity. Workplace diversity is a complex issue. Our findings on it, gathered from nearly 100 U.S. tech startups, offer a unique view on how different factors may affect the gender diversity of a startup’s employees. 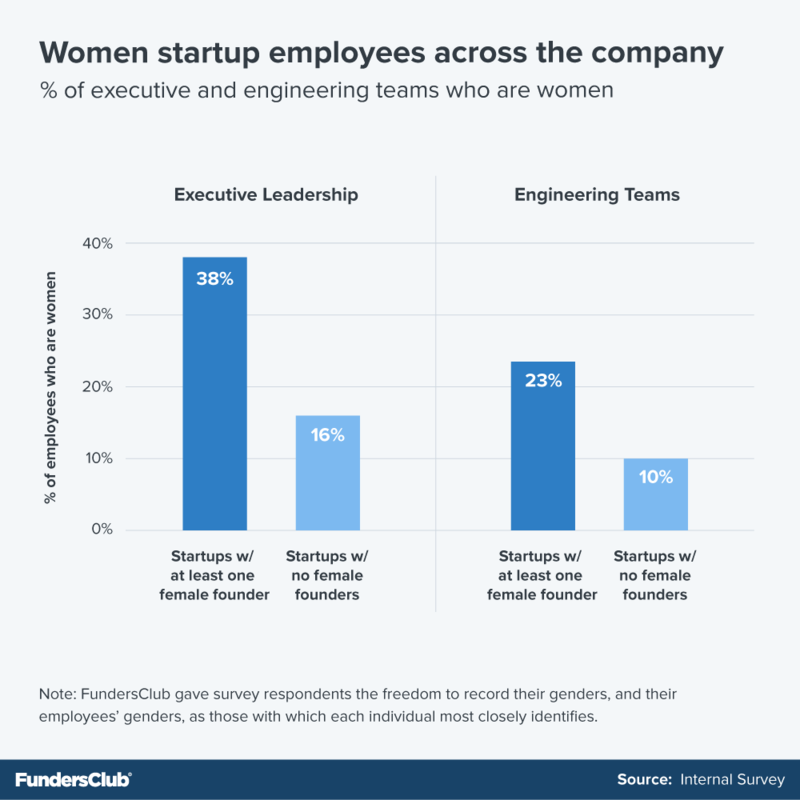 Specifically, we’ve explored the gender diversity of U.S. technology startup founders and how that affects the gender diversity of the employees they hire. Technology is rapidly changing the world; the five most valuable companies in the S&P 500 are all technology companies. Thus, we believe technology startups, whose workforces as a whole will grow by many multiples, are in a prime position to impact the workplace environment, and the world. As a reminder and on the topic of growing workforces, if you are open to new opportunities, we invite you to explore open jobs at our startups that are hiring. 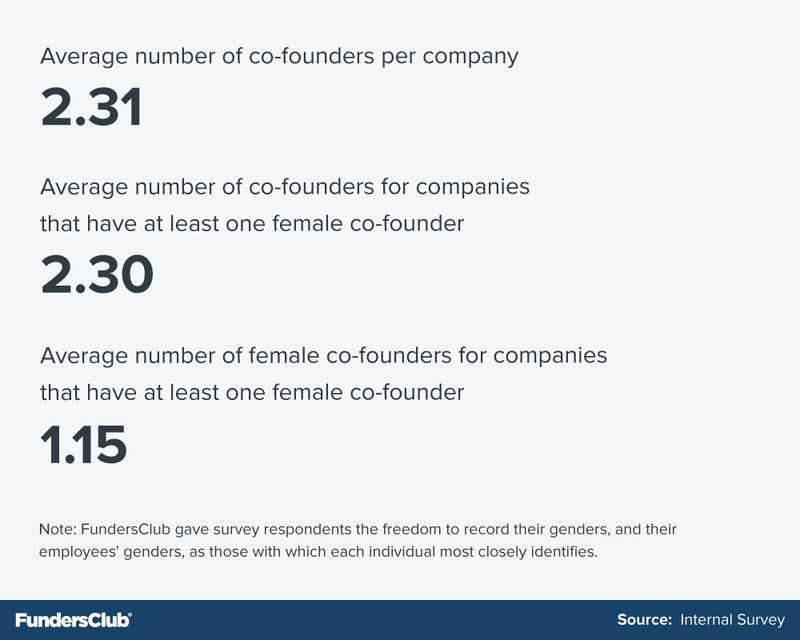 Note: FundersClub gave survey respondents the freedom to record their genders, and their employees’ genders, as those with which each individual most closely identifies. That fact is reflected in all of the survey’s numbers and its graphics. We also found an average 50/50 male/female ratio amongst co-founders of U.S. technology startups with at least one female founder. Even though many of the surveyed founders’ teams are fewer than 20 people, diversity is already top of mind for them. 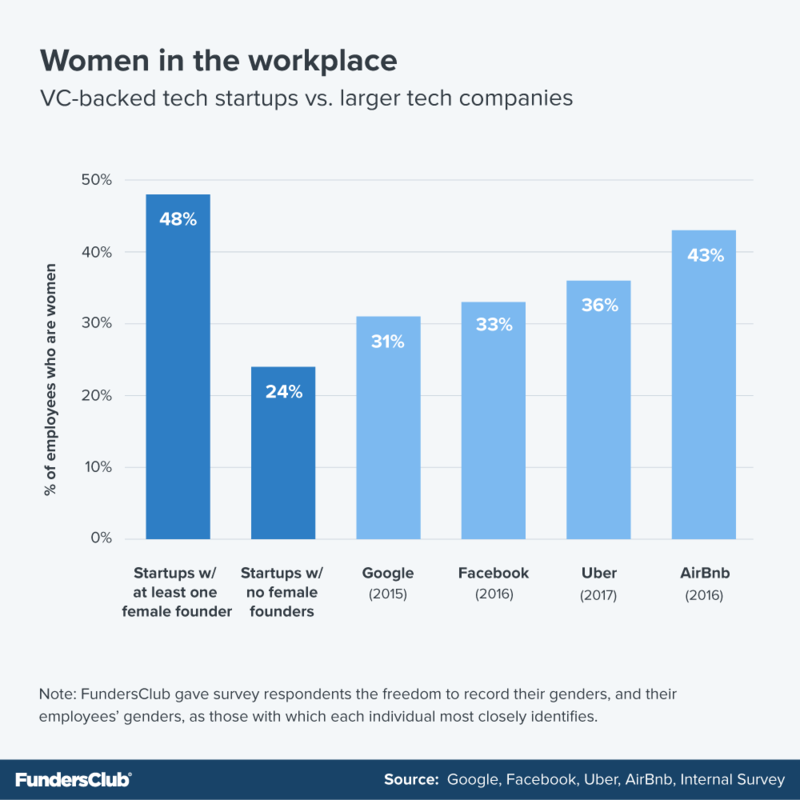 The founders of nearly 100 U.S. technology startups took time to not only submit their diversity data to us, but some also shared frank written feedback and thoughts on workplace gender diversity. Hiring remains one of the most difficult challenges for startup founders. Workplace diversity is a multifaceted topic, and we explored only a few features of it in this study related to gender. The results are fascinating, and we hope, illuminating and actionable. At FundersClub, we are optimistic that a majority of startup founders recognize the importance of building a diverse workplace. If you would like to join them, our own portfolio founders continue to be on the lookout for talented new hires as they build their industry-defining technology companies. Explore open roles at our portfolio startup companies now. Additional work on this piece by Siri Srinivas, Eli McNutt, and Alex Mittal.